There’s nothing like coming home after a long day! Does your home welcome you in? With a chill still in the air this time of year (and many places blanketed in snow), it’s nice to walk in the door and feel instantly cozy, welcomed and at peace! But if your entry leaves you feeling cold or unsettled, here are a few simple and practical ways to welcome your family home (excerpted from my book, Love the Home You Have). Keep your entry tidy and welcoming so your house is one you want to come home to and hate to leave! Light a candle and turn on your lamps for a cozy, welcoming ambience as you and your family come in the door. Turn on some music when you arrive home. It might set just the perfect tone for a relaxing evening. Timers can be wonderful reminders to turn on a few lamps, turn on the heat on a cold night, or turn on a coffeepot or a crockpot with a hot drink, an appetizer, or dinner. You can set the mood your want for your home in so many ways! Here’s another surefire way to create a cozy (and affordable) ambience for your entry (or living room! ): scour secondhand stores for unique pieces to add character and personality! Umbrellas with wood handles, old walking sticks, repurposed metal buckets and plant stands, old crates for organizing, funky tables, rustic and metal frames and art. I shared so many of my favorite tried and true decorating tips, including methods for adding color and texture, mixing patterns, my how-to formulas and helps for decorating and organizing your home in The Inspired Room book, my new best-selling coffee table book (which was just released just before the holidays!). You’ll discover the help you need to arrange furniture to create perfectly comfortable and welcoming rooms, simply by pulling together what you already have. And if you don’t have everything you need right now, I offer simple suggestions for what you should be on the hunt for next! I poured my heart into this book with the hope that it would encourage and help you create rooms you will LOVE to be in right now and spaces that can evolve with you and your style over time! 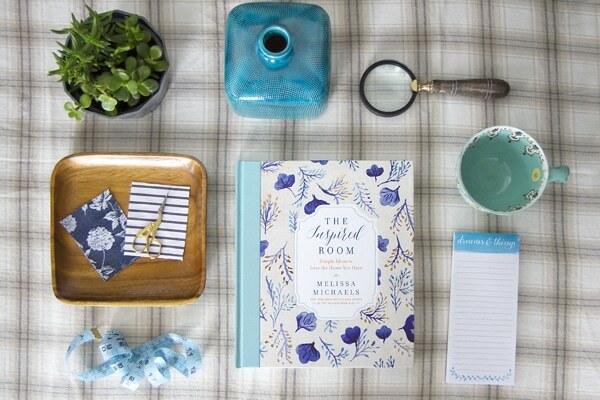 You can order The Inspired Room book for under $20 on Amazon or Barnes and Noble. You can find more encouragement and ideas for homemaking and decorating your home (on any budget) in my New York Times Best Selling book Love the Home You Have (order on Amazon or Barnes and Noble)! I’d love to hear your thoughts on the entry where family comes in — in our house, we come in via the attached garage and travel through the laundry room into the kitchen. So our entry isn’t the same as our guests! I just purchased your book, The Inspired Room, and finished it in one weekend! What a lovely book! I love the cover, it is beautiful and I love the finish. The content of the book is beyond compare! I enjoyed every page. I own many home decor books and this is by far my favorite! I just shared a post about my LACK of an entry in my new home and what I’m dreaming of doing….it drives me crazy that I don’t have anyplace to hang my coat or kick off my shoes! 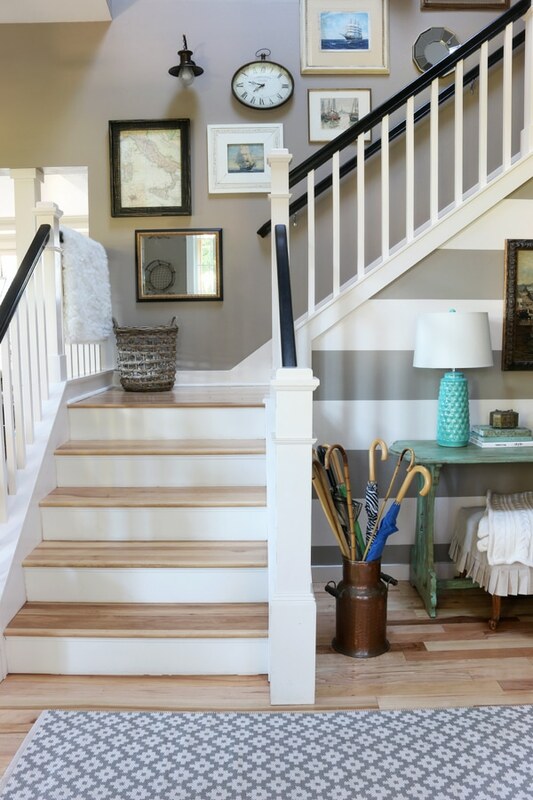 I love the entry in your old house – so cute with the wainscot and the hooks! I love not seeing a giant pile of shoes every time we or someone comes in! But it sneaks up on us … and have to work on all the time. In the home we just sold we had a small entry that had a coat closet on one wall and antique oak small dresser with a lamp, usually a vase of fresh flowers from the grocery store and a scented candle and a small gilded framed mirror above. I loved how welcoming it always felt to come home and received compliments from guests all the time. We will have an even larger entry in our new home and I am looking forward to setting it up to be just as welcoming! Though there will be cost closet further down the hall a bit, I’m thinking of keeping a large basket tucked under our open shelve on our new entry table to keep our everyday outdoor shoes in ( ready to be kicked off and tucked away). 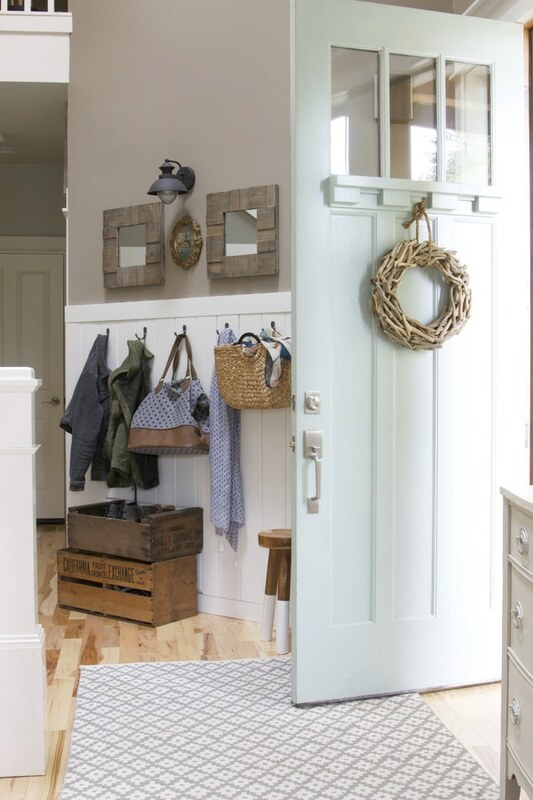 love all your ideas for an entryway. I’m just a few chapters into your book and I’m obsessed! I keep looking back at what I’ve read and the pictures that inspire me several times over. If I keep this up I may never finish it! The cover alone lets you know how special the book is with its design and the different textures. Thank you for your insight and talent! Thank you for your kind words, Barb! It means a lot to me to know you are enjoying the book! Thanks for the ideas….I’m a little perplexed as what to do in our new home we are building…the entry is a good size but doesn’t have any full walls to use….from the front door left is an arch way…front center arch way and to the right stairs and hall… ????? Hi Melissa, I’m strongly considering painting my banisters black in my entryway like you did. I really like the look and mine need painting anyway. What paint did you use? I’m thinking that you had to sand them prior to painting? Any tips would be helpful, thank you! This is a great post. A nice entryway really sets the tone for so much. I’m like you – turning on soft lighting when I walk in. Huge mood lifter! Thanks for the great work!